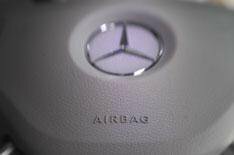 Mercedes nets safety award | What Car? Mercedes secures our safety award for the second successive year, and it's hardly a surprise. There's a host of Mercedes' active safety systems designed to keep you out of trouble, and before you think that these are only available on more-expensive models, think again - they're standard on the new C-Class. The C-Class offers the option of an Intelligent Light System, using bi-xenon headlamps to light up a larger area on country roads and improve long-range visibility on motorways. You'll also get flashing brakelights that warn drivers behind that you are braking heavily. The C-Class safety complement also includes Pre-Safe - a system that puts the front-seat occupants in the best possible seating position if it thinks an accident is imminent. Every Mercedes is fitted with Electronic Stability Control (ESP), anti-lock brakes with Brake Assist, Acceleration Skid Control and a host of airbags designed to give you the best possible protection in an accident. You'll also get head restraints that reduce the risk of whiplash injuries, and airbags and seatbelts that deploy to suit the severity of an accident. Then there's the Adaptive Brake package, which includes technology to make it easier for the driver to pull away safely on steep inclines. Adaptive Brake also primes the brakes in critical situations, and lightly applies the pads to dry the brake discs in wet conditions. You can also fit your C-Class with adaptive cruise control - a system that applies the brakes automatically if it thinks the car is getting too close to the vehicle in front. The list seems almost endless, and it's fair to say that the German brand is a specialist in this arena. It was the first to install crumple zones into its cars' bodyshells (1957), fit diagonal seatbelts (1965) and driver and passenger airbags (1981 and 1988). If you factor in Mercedes' string of impressive Euro NCAP results for crash safety, then you come to one conclusion - Mercedes' approach to safety is unequalled.